My SoCalCycling.com Team teammate Erick Sobey and I got to Arizona early for the Valley of the Sun Stage Race. That’s right. Sun! And lots of it. The dry air and the scorching sun is a lethal combination if you are not prepared for it. Of course wherever you travel to, there will be things you aren’t used to. That’s when it’s key to manage your environment and not let these changing variables mess up your game! A quick introduction for those who aren’t familiar with this 3 day race. A flat time trial is followed by a 96 mile, 6 lap road race with a climb and crosswinds. The weekend is capped off with a technical and bumpy crit. Bumpy because of the pavement, and because of the riders bumping into each other fighting for spots. You see, VoS is one of those stage races that can be won in the Time Trial. The way we would approach the whole weekend as a team would depend on how I would ride in the first stage, a 14 mile out and back TT. While in my mind going for the win in the Time Trial was the priority, finishing in 37 seconds down in fourth place made the road race for our team more simple, we would not be defending all day against a stacked field! Pfew. In the time trial, Ryan Roth of Silber Pro Cycling set a course record with an impressive 28:07. Brandon McNulty of LUX was 20 seconds back, and Justin Mauch of Herbalife was one second ahead of me. Having only two guys, Silber had a lot of pressure on them. But they defended the lead like the pros that they are, helping manage gaps and chase any dangerous breaks. McNulty and Mauch were there solo, not much they could do being marked but to try and sneak away. Taking an early opportunity Mauch got away with a small break on lap one. A gamble, but I commend him for giving it a shot instead of passively sitting in the field. The break was out there for an exhausting 5 laps, grabbing all the KOM bonus seconds. Once the teams organized, bringing back the break was a quick affair. After having caught the break around 1 lap to go, there came a storm of unrelenting and unsuccessful attacks. Me, McNulty, Stefano Barbieri and a few guys had a small gap on the last crosswind straight before the finishing uphill. All we could hope for is the field hesitating and sitting up for a moment. The field was having none of that, and it was a pack finish with Eric Marcotte taking the big W. Mauch lost a few seconds on the last climb moving me to 3rd overall. 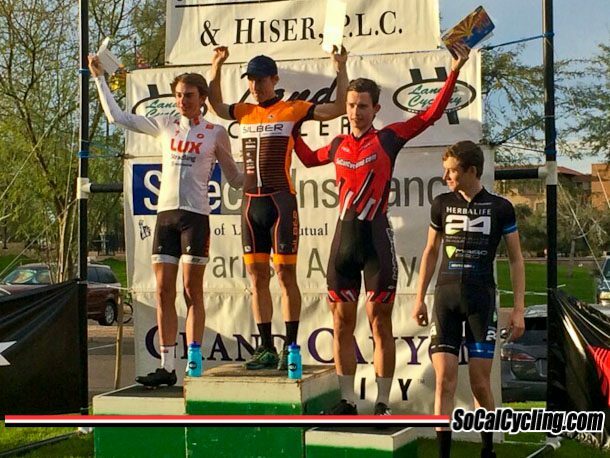 The Crit was quite short for what we are used to in the Pro/1 fields. Will it really be only 60 minutes? I doubted as I double and triple checked the race information. You guessed it, it was attack and counterattack from start to end. I was watching Eric Marcotte closely, as he was now 17 seconds down from me on GC. Combined with a winning time bonus that was too close for comfort. All the top GC guys tried to get breaks going, but the teams neutralized each other, and not a single break could establish. So a sprint finish it was, with the GC leaders staying the same. McNulty even tried a last minute effort, staying solo off the front for what seemed like 2 whole laps and being caught with less then 1 to go. Although unsuccessful, that was definitely the crowd pleaser of the evening. Until next time! Stay safe and don’t pin your numbers upside down!